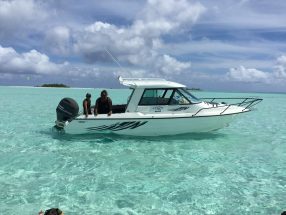 The fishing grounds surrounding Aitutaki provide some of the most exciting pelagic fishing in the South Pacific. 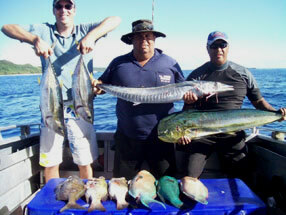 Target species include Wahoo, Mahi Mahi, Yellow Fin Tuna and the Giant Trevally. The Aitutaki Lagoon is aprox 52sq km and is arguably the best snorkelling lagoon in the world. It’s a reasonably shallow lagoon which has an average depth of between 2-5m. Its crystal clear waters sustain a very healthy fish population and with very little current and without any toothy creatures make this lagoon a very safe place to snorkel, for experienced and inexperienced alike. 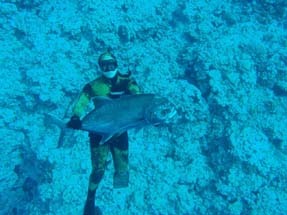 Spearfishing in Aitutaki is most rewarding. Whether it be in the lagoon, outer reefs or the offshore FAD’s chasing Wahoo or Yellow Fin Tuna. We offer packages to suit all levels of experience. We pride ourselves on being able to provide a range of personalised activities that will not only meet, but exceed the expectations of the most decerning traveller or adventure seeker. We believe in quality not quanity, as such our packages cater for small groups only.